Farmers use what they have to make what they need for their family’s nutrition. Small home gardens are common to nearly all households in Myanmar’s Karen communities, and may be second only in occurrence to the pig that can be found being raised underneath so many homes. Like many other countries in Southeast Asia, land in Myanmar is as hard to come by as the protein that needs to be produced on it, making hog production a viable and popular source of animal protein. It would only take a few minutes for a visitor to realize the importance of agriculture to the Karen people. Being omnivores and efficient consumers of household waste, pigs are well suited for integration into small farm systems where space and resources are limiting factors. Even one or two pigs can become costly to feed and will require, in many cases, expensive purchases of commercial feed. For this reason, ECHO seeks to provide appropriate options for using on-farm resources, encouraging farmers to use what they have to make what they need. At our most recent Myanmar Seed Saving Workshop, our team met an attendee who had participated in our first Myanmar training event in 2013, where he learned to make fermented banana stalk silage for hog feed. We were delighted to learn that for the last four years he’s been promoting its use! Now a Program Manager for World Vision Myanmar, our friend is working to spread this technology to communities within his reach. 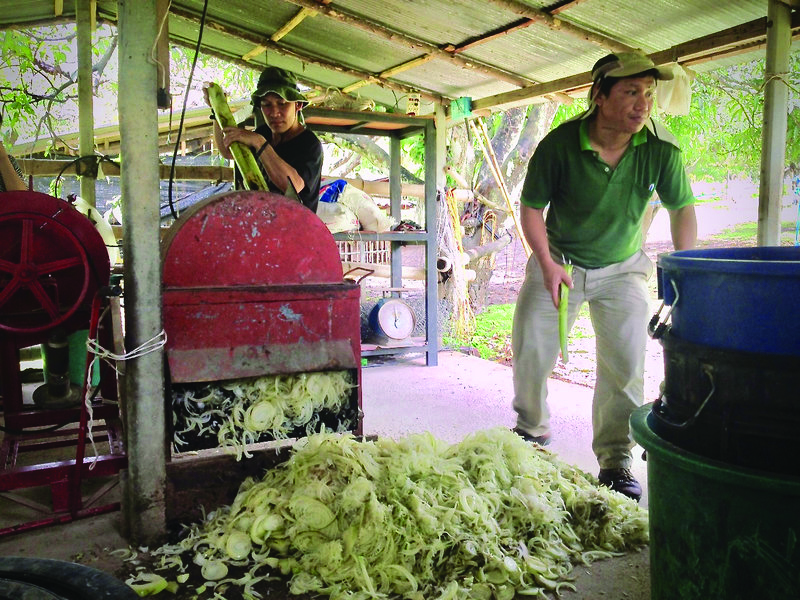 ECHO Staff members Sombat and Boonsong making pig feed from banana stalks in Thailand. One of his ongoing projects, which began with four participants, encourages the production of fermented banana stalk silage to supplement any purchased feeds needed for raising hogs. Through trial and error (and the creation of their own appropriate silage chopper), he and his coworkers have found that they can reduce the need for purchased feeds by up to 75% by supplementing with their own farm-generated feeds, thus improving production margins tremendously. The program now has 120 participants and is expanding to additional communities! ECHO has been teaching urban gardening techniques since the early 80's when Co-founder Dr. Martin Price visited Guatemala City and was inspired by the acres and acres of usable rooftop space being wasted. Shortly thereafter, Dr. Price set up the urban garden demonstrations that ECHO is well known for, including growing vegetables in discarded automobile tires. Some say that the most challenging part of growing gardens in containers is making sure that they receive adequate amounts of water at regular intervals. Self-watering planters exist in all shapes, sizes and price points. ECHO Asia's Patrick Trail shares his tips on building a self-watering container garden with easy-to-find or recycled materials. Materials that you'll need: 5-gallon bucket with lid, a length of PVC, an old t-shirt or cloth, a drill, some screws, a zip tie, and a plastic cutting tool. Want to make this? Tell us in the comments!